Great win but move on sharpish. 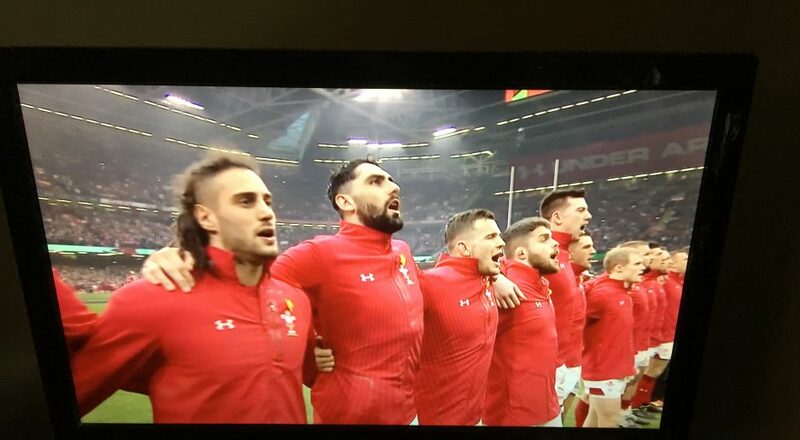 Six Nations, or Division 12 West? An extraordinary bar-of-soap fest in Paris somehow fell, exhausted and drunk, through icy showers, into the arms of the grateful Welsh. They had been willing but mostly awful but the locals had been mercifully, embarrassingly über-French. The inglorious hat-trick of amateur passes that gifted George North the game served yet again as a reminder that Les Bleus have been merely shifting their degree of residence within la Mode Shambolique for a decade; that this laughable refrain about ‘not knowing which France will turn up’ is the very hollowest of clichés. We know, alright. But in the first half, as the rain lashed and the were kicks missed and the passes were dropped, the home side accumulated. Picamoles was ushered towards the line by defenders either distracted by conditions or the man’s physical bulk. Either way it felt a tad feeble. Parra set the tone for some similarly forgettable kicking, by missing the conversion. The home pivot was very much joined in this by Anscombe, who may only retain his place because it’s Italy next, for Wales, and his skills in open play may bloom in that context. Last night he was profoundly ordinary with boot and in terms of his dictation, or otherwise, of proceedings. I repeat the mitigation that conditions were tough but this offers less of an excuse to those charged with executing the kicking game(s), eh? Likewise re- defending. North can’t blame conditions for the clanger that let in Huget out wide of him. Predictably (but mistakenly, surely?) North’s two tries marked him out as Man of the Match but in truth he seemed somewhat marooned again, between Child-Monster Prodigy and Growed-up International Star. Yes, he won the bloody game but does he look, consistently like a talent, a threat, an influencer? Weirdly, no. Liam Williams had either been unlucky or greedy when breaching the line, mid-half but the referee, who spent much of the evening asking politely for calm – ‘lentement, lentement’ – got this one right promptly enough. (Not sure if the drama or dynamism of the second period was particlarly enhanced by Mr Barnes’s steadying hand: in fact once more there was the sense that he may have luxuriating quietly in the knowledge that the cameras were upon him. However overall, he took us through competently enough). A penalty then a satisfying drop, late on, from Lopez sent Wales in 16 points down but it had been a mess: you wouldn’t rule-out anything here, including an error-strewn or error-prompted comeback. It’s kindof what we got. Josh Adams, in a rare moment of slinkiness, eased into space and put scrum-half Williams in. Anscombe converted. Then Parkes hoofed hopelessly forward, only for Huget to spill catastrophically at the line. North accepted. Moriarty was rightly denied a try, following a block by AWJ. France got some possession but this remained – despite the spirited fightback – a non-classic muddle. Moriarty and Tipuric were good but you’d be hard-pressed to locate anyone else into the 7/10 zone. Except Davidi, maybe – increasingly, as the game went on. The introduction of Biggar was inevitable, in the name of structure. 70-odd minutes and Wales are down again, after a scrum penalty and a straightforward nudge over from Lopez. 19-17. Lashing rain. Cold. Then France – the real France? – really do throw it all away. North anticipates the most telegraphed pass in Six Nations history (almost) and gallops clear. For Wales, the kind of win that might spark something. Certainly some challenging verbals, I would think, from Gatland and co. They were poor and yet magnificent… and that happened. What an opportunity, now, given their fixtures! The consensus is that Wales have grown and deepened as a squad, in recent times. Impossible to tell, from this. Next up, some quality, please: then, who knows? < Previous My life’s the disease.